I learned about Carol’s Kitchen in a church bulletin so I decided to call the volunteer coordinator. I heard from Carol’s Kitchen immediately and was assigned to work at Cabazon where there was a strong need for volunteers. I have volunteered for Carol’s Kitchen since June 13, 2011, one year after my retirement, on Mondays in Cabazon. 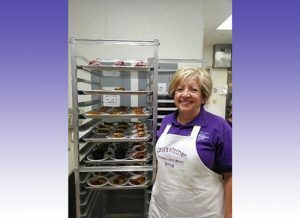 What made you want to volunteer with Carol’s Kitchen? I wanted to give back to the community and at a place where I could make a difference. The manager welcomed me and introduced me to everyone. Even though everyone was busy chopping veggies, preparing salads, pastries, cooking, washing dishes, setting tables, etc., they stopped to welcome me with their friendly smiles. It wasn’t long before I was in the midst of things. I was taken by an aura of joy in the room as everyone worked diligently preparing the meal for lunch. As the guests entered the lunch room to have their lunch, they were greeted with respect and acknowledgement of their presence. They were made to feel important, a place where they belonged. One could hear good conversation and laughter. The cleanup was just as important. It was amazing to see everyone with extra energy and enthusiasm as they worked to leave the place super clean. What do you do at Carol’s Kitchen? As for my role, I do whatever needs to be done to prepare for the meal and help those individuals that need help with their task. Extra duties that I might do is to take turns taking the dish cloths home to wash, help maintain cupboards and storage room clean and organized to make things easier to manage. What pleasant surprises have you encountered by volunteering with Carol’s Kitchen? God’s in charge of Carol’s Kitchen at Cabazon. We come together from all walks of life and with our own life stories to fulfill our Christian duty of serving God’s people and one another. We are all fed. In the four years I’ve volunteered here, the dedication behind what Carol’s Kitchen stands for hasn’t change. The spirit of giving and receiving is at its best. I am very fortunate to be a part of such an amazing staff. Yes, it’s Carol’s Kitchen with God in charge. Come meet Irma! Visit our Cabazon location on Mondays at the Cabazon Community Center.